Taking on a leadership role is a significant moment in any person’s life. It can be the first time that they have had a responsibility for making things happen or the first time they have had to stand out and influence others, rather than being one of many in the team. Along with the sense of excitement that leadership can bring, there can also be a sense of fear and uncertainty about our ability to lead others and deliver to expectations. These are common feelings for anyone taking on a leadership role and they underline why leadership development is so important early in the leadership journey. There are many different theories about how to lead others, and certainly no single ingredient to successful leadership. Some will say that you need to be direct and honest at all times; others will say you need to listen and absorb the ideas of others. The point is that you can’t tell anyone how to lead, as ‘telling’ them undermines the key qualities that will make them a leader. What you can do, however, is help a leader to become more self-aware, to focus on what is most important to them and to learn how to handle the challenges they will meet along the way. The most common challenges that leaders face are: how to communicate effectively to a widely diverse and demanding audience; how to share a personal dream or vision so that others are excited by the future; how to influence and persuade in the face of resistance; and how to see plans through to delivery. In handling these challenges, leaders will face dilemmas that will test their judgement and integrity, that will stretch their understanding of people and that, at times, will leave them questioning how and why they ever took on the responsibility of leadership. 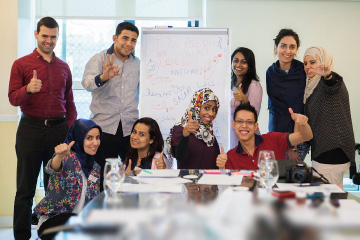 The Mosaic International Leadership Programme (ILP) brings together 80 unique and talented individuals from many different countries, all of whom are taking on a significant leadership responsibility. Rather than telling everyone how they should lead, the programme allows each individual to listen to and reflect on diverse perspectives and insights into the best practices and skills of leadership, and to build their passion and share their vision for change. The ILP helps leaders to reflect on how they might use the skills of coaching to develop others; how they can persuade and influence others; how they can evaluate decisions; how to create the strongest team dynamics; how to enable others to engage in change; and even how to build personal resilience in the face of adversity. These core areas create a greater understanding of personality, motivation and the principles of learning, all based on the psychology of leading others. As a result, each leader goes on to build a unique personal development plan that will guide their actions and focus in the future. Each plan is different to every other, in the same way that every leader will take a different, and very personal, approach to getting the best from the people they lead.